The MVC pattern is adopted pervasively among Web frameworks. Various flavours exist for the pattern but the common goal is to achieve separation of concerns. Under the ZK framework, MVC implementation ultimately requires the Controller to gain reference to, and listen events coming from, the UI components in View. An interesting bit of ZK 6's MVC pattern is the CSS/jQuery Selector inspired mechanism in its Controller that makes this plumbing task simpler and more flexible. In simplicity, ZK is a component based and event driven Ajax Java framework. Understanding this basic description alone is enough to take us through its MVC pattern. Each UI component can listen to event(s). There's a variety of ways to register event listeners to the components. The component declarations make up the View. Although it's possible to construct the UI in Java, akin to GWT or Swing, most would prefer writing mark-up in XML. A ZUL in ZK is an XML compliant page that contains the UI mark-up. One can consider a ZUL page as an Ajax enabled JSP page. The Controller in ZK is a Java class that implements the Composer interface or extends any one of Composer's implementations. SelectorComposer is the target of our investigation in this post. In our controller class, to implement the said features under the ZK framework, we'd need to gain reference to the UI components so the list of available journals can be rendered in the combo box and the onClick event for the Clear button can be handled. Let's elaborate on how selectors are used. When a controller is "applied" to a component, all of the component's children components also become accessible to the controller. Hence the grid and all of its children components define the scope which our controller SubscriptionComposer can take effect. The @Wire annotation on line 3 and 6 take in a CSS selector pattern as its parameter. With the pattern "combobox, the annotation associates the sole combo box in our UI mark-up with the Combobox instance, journalbox declared in the controller class. Once we've obtained references to the UI components in View, we could initialize them accordingly. The doAfterCompose method allows developers to insert instructions to be executed right after the component under effect and its children are created. It's a method invoked by the framework and must be implemented for all classes implementing the Composer interface; such as the SelectorComposer class which we're extending our SubscriptionComposer from. 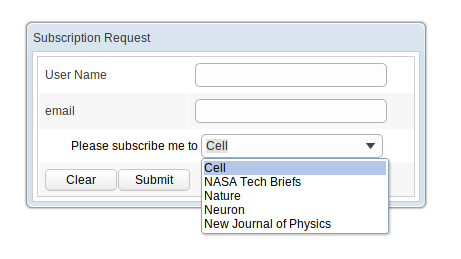 For our hypothetical feature, we need to initialize our combo box by populating it with a list of journals available for subscription. On line 11, the combo box which we obtained reference to via the selector mechanism, is given the model data we prepared on line 10. ListModelList is a wraper class that enables changes made in its wrapped collection to be updated on its host UI component accordingly. Once the combo box is supplied with a list model, the template tag will iteratively create a combo item for each entry in the list model. The @Listen annotation adds method clearAll, as an event listener for the onClick event, to the button matching the pattern button[label="Clear"]. As before, there're many alternatives to the selector pattern shown here. One possibility is cell:first-child button, since the "Clear" button is the only component that matches this pattern. The brevity of the clearAll method is made possible because a single annotation @Wire("textbox, combobox") in fact wired all fields in the UI to a list of ZK components. In a typical ZK controller class implementation, before we can initialize a UI component, listen to its events, or change its state, we must first obtain a reference to that component. This CSS/jQuery selector inspired controller gives us great flexibility in referencing the UI components of interest. A reference can be made by matching a component's ID, class name, component attributes, or by traversing through the component tree. With this flexibility, changes made in the UI cause us minimum grief since the controller code can be updated as easily as coming up with new selector patterns.